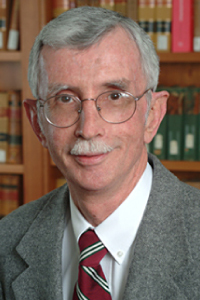 Steve Margeton is Professor Emeritus at the Columbus School of Law of the Catholic University of America. Margeton received his undergraduate degree from Mount St. Mary’s College, now University, in Maryland, a law degree from George Washington University, and his Master of Science in Library Science from The Catholic University of America. In addition to his library, teaching and writing responsibilities, he has served on various American Bar Association panels and site inspection teams and as a consultant on library planning. Currently, Margeton is researching the 120-year history of the Columbus School of Law with an eye toward a future publication. He and his wife, Margaret, their two married daughters, sons-in-law and two grandsons reside in Northern Virginia. Below, he relates what led him to develop his interest in academic library design. I’ve been a law librarian for more than 45 years, but I’ve always had an interest in architecture. My general education certainly was not geared to the pursuit of mathematics, engineering or science, yet the creative aspect of architecture always has had great appeal. My library career has taken me to several different types of law libraries, all in the nation’s capital. I’ve always believed that Washington, D.C. is a law librarian’s dream location: so many types of law libraries with so many opportunities for both new and career librarians. I moved to D.C. to attend George Washington University law school. While in law school, I began working part time at the American-British Law Division of the Library of Congress (LC). LC was a great place to learn the craft of librarianship and see a large-scale library operating extremely well. It offered many opportunities for being mentored and was also a great venue for witnessing innovation such as the implementation of the (then) new class KF schedule for American law and the introduction of MARC cataloging. LC’s Thomas Jefferson Building still continues to be one of the most beautiful edifices in Washington, D.C., noted especially for its marble and mosaics, perhaps an early library design influence on me. After several years at LC, I became the library director at the law firm of Steptoe and Johnson. The firm provided me with my first opportunity to work with architects, furniture vendors, shelving companies and the like. During my tenure at the firm, I helped design two major libraries and two satellite libraries. The firm, like so many others in D.C. in the 70s and 80s, always seemed to be expanding. In 1985, I was sworn in as the ninth Librarian of the Supreme Court of the United States where, among many other responsibilities, I became involved in a modest renovation to the library. Making any changes at the Court is always difficult because of the building’s designation as a National Historic Landmark. However, working carefully with the Architect of the Capitol, the library staff was able to create two small suites in what was formerly unfinished, raw space that dated back to the early 1930s building construction. In 1988, I accepted the library directorship of the Columbus School of Law of The Catholic University of America, a position I held for 25 years. The Catholic position appealed to me for several reasons: the move into academia, the possibility of doing some teaching and writing, and the opportunity to join a faculty committed to constructing a new law building. The first years were great fun, switching to an academic setting, meeting interesting deans and colleagues, conferring with students and, if that were not enough, working with architects on a new 166,000 sq. ft. building—including a 50,000 sq. ft. library. Collaborating with talented architects, interior designers, furniture manufacturers and a great building committee occupied much time during my early years at the law school. The building planning and design took about a year and a half, followed by the necessary building financing phase, and then, finally, a two-year construction process. Looking back, I thought we’d never occupy the new facility, but, to my amazement, 2017 marks our 23rd year in the building. 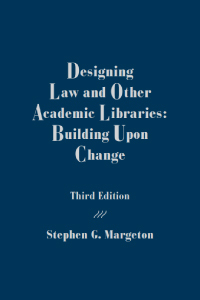 As one might guess, Designing Law and Other Academic Libraries: Building upon Change, to some degree, resulted from the law building’s gestation. However, in writing the book I tried to stay away from the “This is how we did it” approach, incorporating whenever possible the construction experiences of other librarians. I’ve also included many tips learned from design professionals throughout the years, as well as from American Bar Association conferences on law school design and similar workshops. For this reason, I am especially indebted to the 13 contributors who are featured in the third edition. They have been most generous with their time, expertise and photographs. Order by March 31, 2018 and Save 10%!